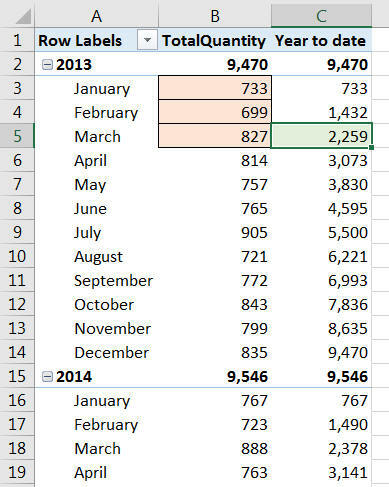 For example, the cumulative sales for March (2,259; shown shaded in green) should and does equal the sales to date for the year (that is, 733 + 699 + 827). The function returns the set of dates up to and including the "current" date in the specified year (the DATESQTD and DATESMTD functions return the equivalent dates for the current quarter or month). The second argument allows you to change your year-end from the default of December, as described in this earlier blog. 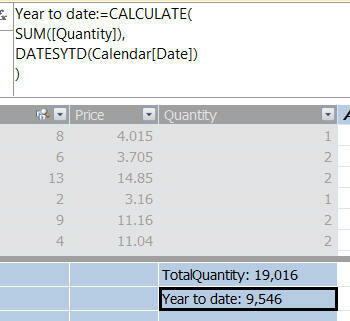 Calculate the total quantity sold, but instead of using the default dates for the query context, use the dates for the year up to and including the last date of the current period for each query context instead. Sum an expression using a given calendar date field. As for the DatesYTD function, you can change the financial year end as described here. Here are the two alternative approaches shown side by side, just to show that they give the same result! The two functions give the same answers, reassuringly. Time now to have a look at functions which give a comparison with the same period in the previous day, month, quarter or year.